Dog costumes for kids can be used well past Halloween. In fact, children howl at the chance to don the doggone cute getups year-round. Dressing up like a dog is a kick for kids. The universally popular costume is also a hit with parents given how easily accessible it is. Whether your kids want to look like Snoopy, Astro, Maramaduke, or Clifford the Big Red Dog, making their dreams a reality doesn't have to drive you to the brink of insanity or to the poorhouse. Dog costumes for kids can be bought or created with everyday household items. While you can get fancy dressing your kid like a pooch, sometimes simplicity says it best. A basic pair of floppy ears and a spotted stuffed tail can go a long way to make your little princess puppy worthy. Dog costumes are also versatile enough to pass on from sibling to sibling. What's more, since puppy getups are gender neutral, you can keep the costume in the family for years to come. If you need a dog costume for your child right away, then your best bet is to purchase a pre-made suit. Fortunately, there is no shortage of puppy costumes available for kids of all ages, from infants and toddlers to preschoolers and grade schoolers. While the aforementioned websites offer some of the most adorable canine costumes for kids, most of them are plush and warm, and really should not be worn in hot climates for extended periods of time. By handcrafting a dog costume for your child you can tailor it to his or her specifications. For example, if your son is dead-set on dressing up like a brown St. Bernard rather than a spotted Dalmatian, then look for a brown sweat suit or fleece jumpsuit and attach floppy ears, a stubby tail, and hang an empty barrel around his neck. If you live in a warm climate, consider substituting the sweat suit for a pair of leggings and a light, long-sleeved shirt. Add a simple headband which features faux fur ears. You can also purchase separate dog tails that can be threaded through a thin belt or safety pinned and attached to your child's pants. 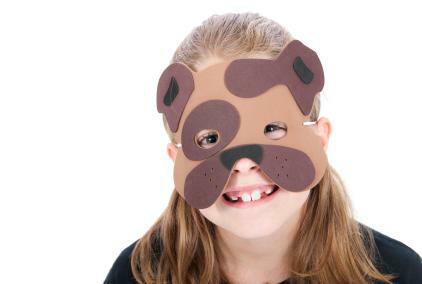 With a little creativity you can easily make your child a dog costume that expresses his individuality. The sky is the limit when it comes to constructing a costume of any breed dog. For example, if your daughter wants to trick-or-treat as a pink poodle, then purchase a pink sweatshirt and pants, and make long ears and a tail from pink felt. To replicate the poodle's curls, cut up curly scarves and attach the material to the sweat suit. You can also add extra curls to the cuffs and ankles. Round out the look by adding pink fluffy slippers and pink fleece gloves. Finally, no realistic looking kids' dog costume is complete without a few accessories. Cut up an old belt to make a collar or make your own from a plastic band that can be blinged out with rhinestones. Dog tags can be made from inexpensive medallions and leashes can be made safely with soft cotton ribbon.